In finance, there are areas where formulas tend to get involved. Sometimes it may be easier to follow an exact computer routine. 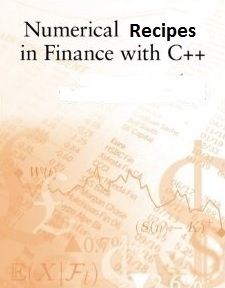 The author has made some C++ subroutines that implements common algoritms in finance. Typical examples are option/derivatives pricing, term structure calculations, mean variance analysis. These routines are presented together with a good deal of explanations and examples of use, but it is by no means a complete "book" with all the answers and explanations. All the routines have been made to confirm to the new ISO/ANSI C++ standard, using such concepts as namespaces and the standard template library. The latest (2011) C++ standard introduced a few useful simplifications, which is incorporated in places. I'm planning to turn it into a book, but even in its incomplete state is should provide a good deal of useful examples and algorithms for people working within the field of finance. The manuscript and codes will be added to as I get time. All the code should conform to the current ANSI C++ standard. This book is a a discussion of the calculation of specific formulas in finance. The field of finance has seen a rapid development in recent years, with increasing mathematical sophistication. Bernt Arne Odegaard is a Professor at the University of Stavanger, in Stavanger, Norway.